When a Spell/Trap Card, or monster effect, is activated: Reveal 1 Counter Trap in your hand, then discard 1 card and pay 1000 LP; negate the activation, and if you do, shuffle that card into the Deck. Then, you can Special Summon 1 “Parshath” monster from your Deck or Extra Deck. Rebirth of Parshath is a Counter Trap that does a lot, but can cost a lot. Negate a spell/trap or monster effect, but instead of destroying it, you shuffle that card back into the deck. Cycling back a resource for the opponent isn’t always preferred, but it can be handy when avoiding destruction effects. A lot has to be done for this card to get from start to finish: reveal a Counter Trap, ditch a card from the hand, AND pay 1000LP. If you don’t have a Counter Trap you are out of luck. If you don’t have 1000LP, out of luck. Counter Trap the only card in your hand? Bye-bye hand. A strong negation yes, and then you get a free Parshath monster from your Main or Extra Deck. In Counter Fairies you may not run that many Parshath monsters, but you could always run a Synchro Parshath monster to drop abruptly with this card. Their field spell Sanctum can get you back several Counter Traps, but you’ll need that on the field to help balance the requirements of this card. I think this card has potential, and you don’t need to Special Summon a Parshath monster, but you’ll want to so you break even (minus the 1000LP). There are easier Counter Traps that cost less that do the same as Rebirth though. Divine Punishment does everything this card does and only needs “The Sanctuary in the Sky” on the field. Rebirth of Parshath is a Counter Trap with a heavy cost. to be able to negate anything you must show a Counter Trap from your hand and pay 1000 Life Points and Discard a card. Fortunately, Guiding Ariadne makes the last two parts of that disappear. The card negated gets shuffled back into the deck. Non-targeting removal is always great. Then you have the option to Special Summon a Parshath monster from the Extra Deck or Main Deck. So with Ariadne, you gain advantage, without, you break even. A break even card for 1000 Life Points is worth the space in many decks. It is absolutely necessary in Counter Fairy’s. Score: 3.75/5 Art: 3/5 Rebirth is the wrong name. Of course a Counter Fairy deck will have a new Counter Trap, and thankfully a pretty solid one, Rebirth of Parshath. Rebirth of Parshath is a Counter Trap, the best kind of Trap in the game. It has a few costs though as you must reveal a Counter Trap in your hand, pay 1000 LP, and discard a card. Guiding Ariadne makes sure you don’t have to pay the 1000 or discard a card, but you usually would love to set all of your Counter Traps if you can, yet this thing makes not setting one worth it to be honest. Once you do all of the previous things, you can negate a Spell/Trap or Monster effect, shuffle the negated card into the deck, and then summon a Parshath from the Deck or Extra Deck. Extra Deck is because there is a Parshath Synchro, which you might remember if you went to The Duelist Genesis sneak peek. Despite that being a thing, you will likely summon the newest Parshath boss monster from the main deck. Sure, this can summon Airknight Parshath, which I am sure is a Goat Format favorite, but sadly Airknight doesn’t hold up to 2018 standards and the next form of Airknight wasn’t really played before except for fun decks, doubt it will see play now honestly. This is overall a good Counter Trap card for the Counter Fairy deck, especially considering you should be playing at least one of the new boss monster and you don’t really have anything to lose by playing the one Extra Deck Parshath so far… Parshath Link in the future? I like this card for those Counter Trap heavy decks. The “Parshath” theme has always been abhorrent to me, not because I hate the effects, but because I’m reminded of the horrible TCG translation. How they turned “Angel Knight Perseus” into Airknight Parshath is a mystery to me, but it has been a permanent fixture on my all-time worst translations list. The card I’ve always liked though. In fact, my personal opinion is that the OCG Mythological Age Super Rare is one of the prettiest cards from the old era. The art was just as alluring as the effect. An effect that, sadly, was never truly capable of being great over an extended period of time. But now he gets some support. And while the best versions of the deck still may not run the OG, there’s probably little harm in teching one of him. Rebirth of Parshath is a trap more intuitive to counter fairies than to Parshath. So it’s nice that the new boss, Sacred Arch-Airknight Parshath can be run in nearly any fairy deck. 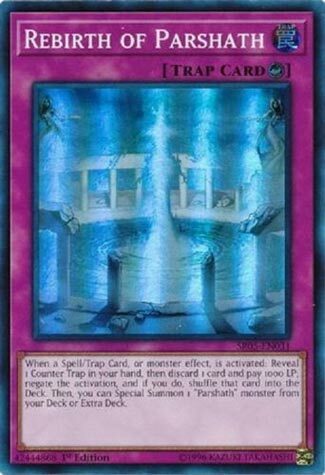 This trap and Sacred Arch amount to a 6-card engine, which is popular with Konami these days. Even so, this one is particularly potent. With Guiding Ariadne in play, Rebirth of Parshath becomes a card arguably more powerful than any in the game. Interestingly, this card seems to specifically counterweight Ariadne’s effectiveness with the card, forcing opponents to at least reveal a counter trap before forgoing the other costs. The ability to pull monsters from the deck or extra deck afterwards ensures this card will have a long future as long as it’s not restricted or banned, which could very well happen once fairies are allowed to be dominant again. And since it’s not theme-reliant, Rebirth of Parshath need not be associated with actual Parshath monsters to even be effective. This is one busted little trap with max potential.